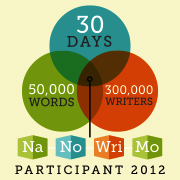 This is the part, when I tell everyone, that I signed up for NaNoWriMo (National Novel Writing Month). Which is a writing challenge in November (every November) and writers, who are crazy OR good enough to enter (I count myself to the first group) have to write a Novel of 50000 words within 30 days. And why am I declaring it? Because even though I really doubt that I can get anywhere near to 50k but what if I can? What if there’s a story within me as well? And what if the guilt and shame I would feel when I gave up after a week, will prevent me of giving up at all? My goal is to make it through the 30 days, writing as much as I possibly can and if that doesn’t make the 50k mark, only 20k, then who cares, I did what I could, I’m going to be happy and proud, and I’m going to be a Winner, no matter what everyone else says. And there’s always going to be a next year, if I still feel like writing. This entry was posted in book, NaNoWriMo, writing and tagged 30 days, crazy, NaNoWriMo, novel, November, writing, writing challenge by eszternagy. Bookmark the permalink. Do it! Do your best! I’ve been doing it for about 9 years and only got 50k words three times. There have been years I stopped at around 11k, 20k and 35k. It’s a lot of fun in just trying and declaring you’re going to be doing it helps hold you accountable!